Judging by the flowers, stuffed animals, and chocolates on store shelves, Valentine’s Day is upon us. If you or your friends and family members are looking for romance, make sure to be choosy about that next sweetheart because anyone can become a victim of a romance scam . Perhaps your friend meets someone new and they both seem smitten quickly. After a few weeks, the new darling asks your friend to loan them money or wants control over your friend’s bank account. And that’s when you realize that your friend has fallen for a scam instead of a new love. These scams happen when a new love pretends to be interested in you as a way to get your money. In fact, they may not even be who they say they are. Romance scammers focus on single people, often older adults who might be more trusting. Widows and widowers, LGBT elders, and isolated single adults are common targets, but scammers look for anyone eager for a new relationship. Romance scams can happen in person, but often happen online through social media or dating websites and smartphone apps. 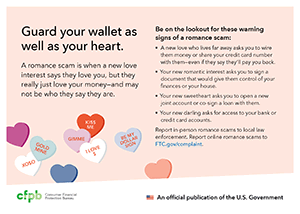 The CFPB created a new romance scam prevention placemat to help older adults who might fall under the spell of a scam artist. The placemat is part of a series of consumer education placemats that meal service providers deliver to homebound seniors and senior meal sites. The placemats are free to download or order in bulk. 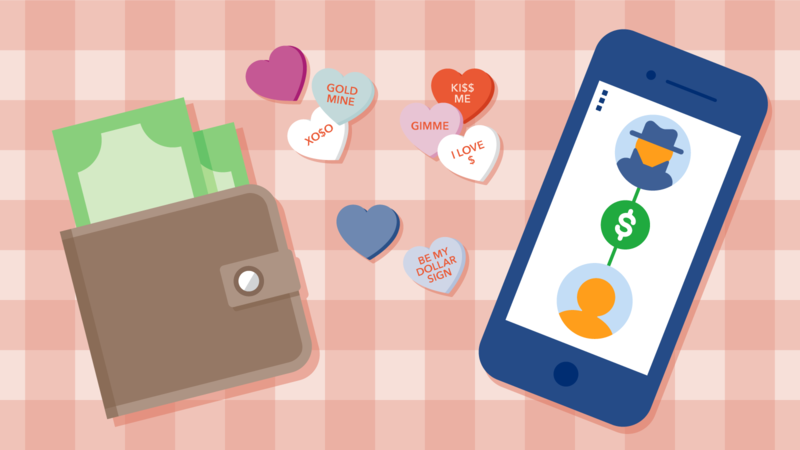 A new love who lives far away asks you to wire them money or share your credit card number with them—even if they say they’ll pay you back. Your new romantic interest asks you to sign a document that would give them control of your finances or your house. Your new sweetheart asks you to open a new joint account or co-sign a loan with them. Your new darling asks for access to your bank or credit card accounts. Protect yourself and others from romance scams. Don’t give a new friend access to your money—including ATM cards, bank accounts, credit cards, or investment accounts. Place an order of our romance scam prevention and awareness placemats and share with people in your community. The placemats can be used year-round to help educate older adults and others about romance scams. Report any crimes to your law enforcement’s non-emergency number. If you suspect that someone is a victim of elder abuse or financial exploitation, report it to Adult Protective Services (APS). Find your local APS at eldercare.gov . If you think the person’s safety may be at risk, call 911. Report romance scams and financial abuse to your state attorney general. Visit the National Association of Attorneys General website for the contact information of your state attorney general. Report suspected romance scams to the Federal Trade Commission at ftc.gov/complaint .